It was not lost on either industry observers or new car buyers that even the smallest and cheapest American cars were growing steadily bigger and more expensive. Even before the U.S. entered the war, a few mavericks like American Bantam and Willys-Overland tried to reverse that trend with a variety of inexpensive compacts ranging from the relatively conventional Willys Americar to the two-cylinder Crosley microcar. None was particularly successful, hampered by awkward styling, anemic performance, and poor distribution. Nevertheless, some automakers and would-be automakers still believed there would be a strong market for such a car if it were done right. “Americar” was the patriotic moniker applied to the 1941–42 version of Willys’ compact car, essentially a facelift of the car Willys had offered since 1937. It was about 180 inches (4,560 mm) long on a 104-inch (2,642mm) wheelbase, very similar to the later Hudson Jet. Sole engine was a 134 cu. in. (2,200 cc) four with 63 hp (47 kW). Willys sold fewer than 30,000 of these cars from 1941–1942, but they were popular with hot rodders. Like many survivors, this example has been heavily modified and now sports a Chevrolet 502 cu. in. (8,225 cc) crate motor under the hood. During the war, even the Big Three toyed with the idea of compact cars. Until 1945, no one was sure what the postwar economy would be like. The end of the Great War had brought a lingering economic malaise that did considerable damage to the auto industry and even some General Motors executives feared that when civilian production resumed, buyers would be scarce. To forestall that eventuality, Chevrolet began development of the compact Cadet, while Ford developed a “Light Car” that hearkened back to the no-frills simplicity of the Model A. By V-J Day, it was clear that however devastated the war had left Europe and Asia, the American market was primed for a consumer bonanza. With a robust seller’s market, most automakers decided there was no point in tooling up for economy cars. Chevrolet canceled the Cadet while Ford sold the Light Car to its French subsidiary, where it became the 1949 Vedette. Henry Kaiser and Joe Frazer, who’d wanted to enter the market with an inexpensive people’s car, postponed those plans in favor of conventional full-size models. Even as they lined up to buy new full-size Fords, Chevys, or Plymouths, however, some customers still clamored for something smaller and cheaper. Despite stringent anti-inflationary measures, list prices were hundreds of dollars higher than in 1941 and up to three times their mid-thirties levels. Furthermore, while gasoline was no longer rationed in the U.S., many buyers remained concerned about gas mileage and general operating economy — memories of the Depression were still fresh. 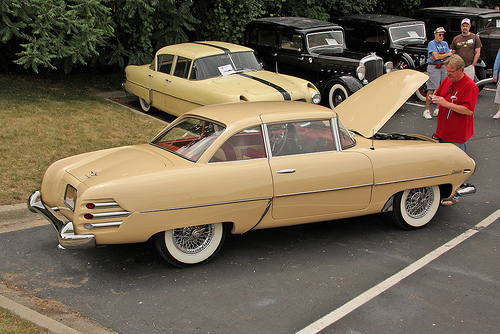 As we’ve previously seen, Nash became interested in compacts during the war, leading to the launch of the Rambler in April 1950, later followed by the Anglo-American Nash Metropolitan. Henry Kaiser, meanwhile, had not lost interest in building an inexpensive people’s car, resulting in the compact Henry J, which appeared in the fall of 1950. The Rambler and Henry J got off to a good start. Between April 1950 and the end of the 1951 model year, they sold more than 150,000 units, a little under 3% of the domestic market. By Big Three standards, that was very modest business, but it was enticing to the independents. 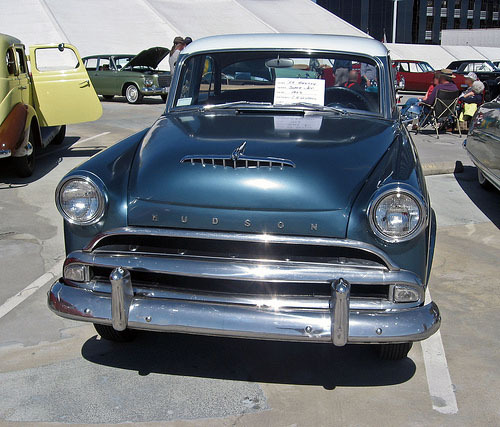 By comparison, Hudson’s total 1951 sales were about 132,000. If compacts were a market segment that GM, Ford, and Chrysler chose to ignore, so much the better. It was during that first flush of success that A.E. Barit launched Hudson’s own compact, the Jet. It was a big investment — $12 million, representing all of the company’s 1948-49 profits — but it promised to take Hudson into a promising new market segment. The Hudson Jet, like all Hudsons of its era, was designed under the auspices of styling director Frank Spring. Spring, who had joined Hudson in the early thirties, was the scion of a wealthy California family. Educated in Europe, he earned his degree in aeronautical engineering from the École Polytechnique. He enlisted in the U.S. Army Signal Corps during World War I, cultivating a life-long love of both motorcycles and airplanes. After the war, he became an automotive engineer, joining the Walter M. Murphy Company in the early twenties and becoming Hudson’s head of styling in 1931. Spring was a colorful and unusual character. Although he cultivated the image of a dashing millionaire sportsman, he was as fascinated with Eastern philosophies as he was with machinery and sports cars; he and his wife even practiced yoga, then still little-known in the West. Spring’s crowning eccentricity was sometimes riding to work on a big BSA motorcycle, silk scarf trailing rakishly behind him. 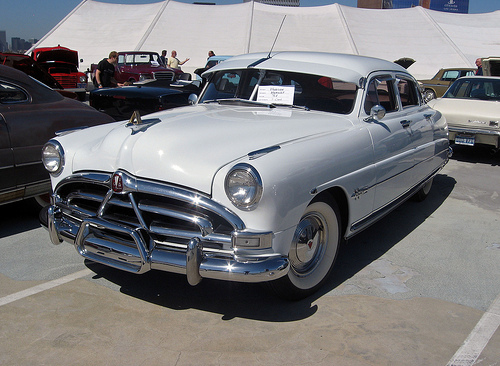 The Hudson Hornet, introduced in 1951, remains by far the most famous Hudson model, thanks in large part to its impressive NASCAR career. Although its design was supervised by Frank Spring and emerged in part from Spring’s fascination with prewar race cars, it was primarily the work of Hudson stylists Bob Andrews, Bill Kirby, and Art Kibiger. Andrews and Kibiger left Hudson for Willys-Overland in 1946, although Andrews apparently remained close with Frank Spring afterward. Like Packard’s Ed Macauley, Spring was not a stylist in the technical sense; he did not draw or sculpt, but rather set the tone and direction for Hudson’s small design staff. During his long tenure, Hudson design was seldom groundbreaking, but always pleasant and tasteful and as finely detailed as Spring’s own wardrobe. Although Spring’s sensibilities were seldom radical, they still sometimes clashed with A.E. Barit’s extremely conservative mindset. Barit had been very uneasy about the low-slung Step-Down cars, for instance, although in that instance, Spring and Millard Toncray, now Hudson’s chief engineer, had convinced him to change his mind. In the case of the Jet, however, Barit’s judgment ultimately won out, to Hudson’s great cost. 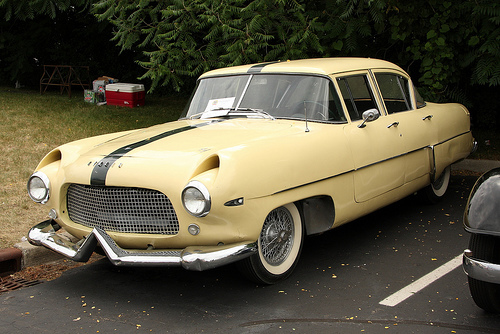 The Hudson Jet’s most direct inspiration was the Fiat 1400. 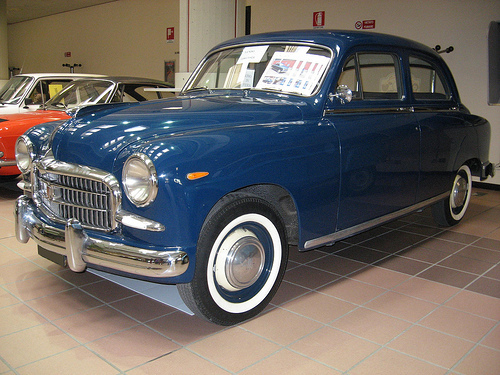 The 1400, launched in 1950, was Fiat’s first unit-bodied car, a boxy, upright sedan with a 1,395 cc (85 cu. in.) engine. Though tiny by American standards, the 1400 was quite large for a European family sedan of its era. According to legend, the wife of one senior Hudson official test-drove a 1400 shortly after its introduction and became quite taken with its roomy, upright seating, which belied the modest dimensions. At her request, her husband suggested to A.E. Barit that Hudson should model its new compact on the Fiat. Some of the Jet prototypes actually wore Fiat badges as a disguise. The early concepts that Frank Spring’s team created were very European, but they sacrificed the Fiat’s boxy profile and upright seats for a lower roofline, complemented by a drooping nose, sloping tail, and low fenders with V-shaped air scoops. Most of those features would have been considered very au courant in Europe, although whether the American public would have accepted them is an open question. In any event, Barit didn’t like Spring’s proposal, insisting on higher seating, which required raising the roofline significantly, and a squared-off hood and deck with higher fenders and round, Oldsmobile-like taillights. All of that was bad enough as far as Spring was concerned, but there was also another voice to consider: Chicago-area Hudson dealer Jim Moran, whose stores accounted for a significant chunk of the company’s total annual volume (around 5%) and who consequently had considerable influence on Hudson management. Moran had been very taken with Ford’s all-new 1952 cars and convinced sales president Norman VanDerzee — and in turn Barit — to steer the Jet in that stylistic direction. While the 1952 Ford was a good-looking car, Spring protested (rightly, we think) that its styling cues would not work on the much smaller Jet, particularly with the proportions Barit was demanding. However, Spring was only a director, not a vice president, and he was soon overruled. Under protest, he directed his team to create new design studies incorporating Barit and Moran’s suggestions. As Spring had feared, the results were rather dowdy, sacrificing the early concept’s Italianate flavor for a stubby, slab-sided look. To Spring’s considerable dismay, rather than being dissuaded, Barit loved the new design and immediately approved it for production. Spring was crushed; he had been very invested in the original design and was very unhappy to see it so badly compromised. Spring’s sole consolation was that Barit’s son Robert, Hudson’s vice president of purchasing, subsequently made a deal with Milan’s Carrozzeria Touring to build a limited number of coupes based on Spring’s original design. The result was the Hudson Italia; see the sidebar below. Carrozzeria Touring was established in Milan, Italy, in 1926. Both before and after World War II, it created bodywork for a variety of elite automakers, including Alfa Romeo, Aston Martin, Ferrari, Isotta-Fraschini, Lancia, and Maserati. Many used Touring’s patented Superleggera (super lightweight) system, a tubular steel framework covered with hand-beaten aluminum panels. With work still scarce in Europe after the war, Touring, like its rival, Carrozzeria Ghia, began soliciting business in the United States. Their principal selling points were an abundance of highly skilled craftsmen and very low labor rates, which made it possible for the Italian design houses to build concept cars or low-volume limited-edition models for far less than it would cost to assemble the same cars in the U.S., even accounting for transatlantic shipping costs and import duties. Each Italia began life as standard Hudson Jet with Twin H-Power. All but one had the standard non-overdrive three-speed manual. The cars arrived in Milan in CKD form to spare Touring the trouble of disassembling them. Touring cut down or discarded the vertical members of the Monobilt body, leaving the underbody portion of the frame (which was a formidable thing even without the bracing of the welded vertical members) and the floorpan. The Italian workers then added a Superleggera superstructure and hand-beaten aluminum body panels. Although the results were far less stout than the standard Monobilt steel-bodied Jet, the aluminum-bodied cars were as much as 500 lb (227 kg) lighter, providing excellent performance. Borrani wire wheels provided a finishing touch. Frank and Clara Spring picked up the first Italia prototype from the Touring works in Milan in the summer of 1953. Hudson announced the Italia to dealers in September 1953, quoting a price of $4,800 FOB Detroit. The Italia appeared at most of the major U.S. and European auto shows, where it received mixed reviews. Hudson did little to promote the Italia and there were apparently only 19 U.S. orders, although at least some of the remaining cars were sold in Europe. The contract with Touring was terminated in 1954 following of the merger of Nash and Hudson. Because of Touring’s low costs, however, it appears that the Italia was the only Jet that didn’t lose money for Hudson. After Touring built the Italia, Spring had his team start working on a larger, four-door version, dubbed X-161, which Spring intended as Hudson’s successor to the Step-Down, possibly for the 1955 or 1956 model year. Hudson’s financial problems meant that it wasn’t to be, but Touring built at least one (and possibly several) X-161s, created by modifying a Hornet in the same way the Italian craftsman had converted the Jet. Frank Spring owned the X-161, or one of them, until his death in 1959. Hudson announced the Jet in early 1952, about a year before it actually went on sale. Hudson expected to sell 200,000 units a year in addition to its existing volume — shades of 1929. It was a bold and hopelessly optimistic prediction. The compact revolution begun by the Rambler and Henry J was already losing steam. 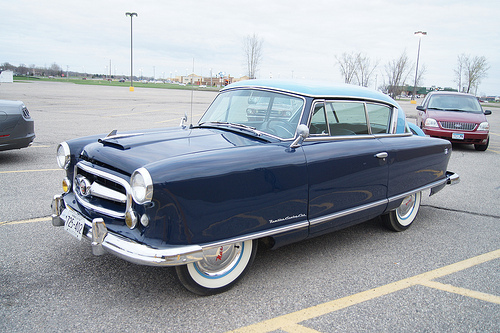 Rambler sales were down more than 20% for 1952 while the Henry J fell by more than half. The new Aero Willys stole some of that business, but combined sales of all three compacts didn’t quite reach 114,000, down nearly 25% from 1951’s total. The problem was that the primary appeal of compact cars for American buyers had been the prospect of lower prices. Many buyers assumed that selling prices went hand in hand with size and expected that a compact economy car would mean a return to prewar pricing. The truth was that compact cars were not substantially cheaper to build than big ones; that was part of the reason Chevrolet and Ford had abandoned their small car programs in the mid-forties. Buyers who might have liked an austere little car like the Henry J if it were priced at $995 were notably less interested when the price climbed above $1,400. Recognizing that dilemma, Nash tried to position the Rambler as an upscale second car for affluent buyers, but its higher price limited its market penetration. 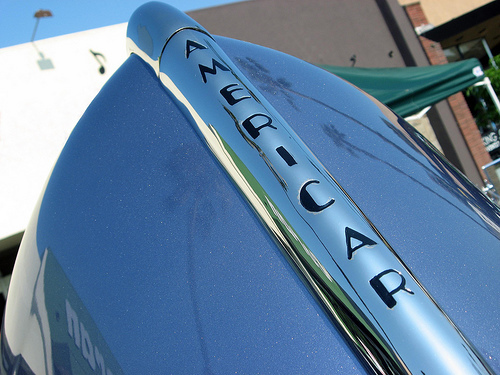 Without the enticement of a lower sticker price, American buyers had no strong incentive to buy smaller cars. By the late forties, most U.S. states based registration and license fees on price, not engine displacement, and even in areas that did have displacement-based fees, the cost difference was seldom enough to sway buyers — a sharp contrast with Great Britain, France, or Italy, where market segments were largely defined by taxable horsepower ratings. Smaller overall dimensions were an advantage in urban areas, but American streets were still less crowded than those of many European cities. Furthermore, many U.S. owners lived in suburban or semi-rural areas where compactness was no great virtue. Gasoline was cheap in America and while some scientists and engineers were already concerned about the limits of oil supplies, it had not yet become a political issue. As for air pollution, smog was perceived as a regional problem and the public did not yet correlate it with automotive emissions. In sum, there was a market for compacts, but it was not yet as big as the independents hoped — something Hudson was about to find out the hard way. 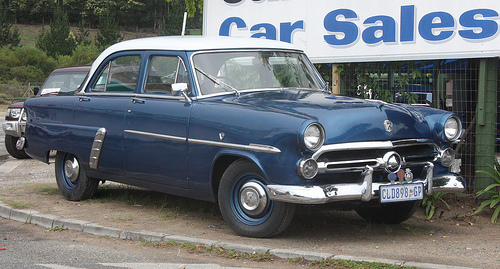 From the front, the Hudson Jet’s resemblance to the 1952–1953 Ford is readily apparent. Note the crease above the Hudson lettering — in the original design, that was the leading edge of the downward-sloping hood. The air scoop on the hood is purely cosmetic; the original concept had brake-cooling scoops atop each front fender, like the Italia.